INERGEN agent is a mixture of three naturally occurring gases: nitrogen, argon and carbon dioxide. As INERGEN agent is derived from gases present in the earth’s atmosphere, it exhibits no ozone depleting potential, does not contribute to global warming, nor does it contribute unique chemical species with extended atmospheric lifetimes. Because INERGEN agent is composed of atmospheric gases, it does not pose the problems of toxicity associated with the chemically derived Halon alternative agents. INERGEN agent is a plentiful, non-corrosive gas that does not support combustion nor react with most substances. INERGEN agent contains only naturally-occurring gases which have no impact on the ozone or the environment in general. INERGEN agent is a mixture of three inerting (oxygen diluting) gases: 52% nitrogen, 40% argon, and 8% carbon dioxide. INERGEN agent extinguishes fire by lowering the oxygen content below the level that supports combustion. When INERGEN agent is discharged into a room, it introduces the proper mixture of gases that still allow a person to breathe in a reduced oxygen atmosphere. It actually enhances the body’s ability to assimilate oxygen. The normal atmosphere in a room contains approximately 21% oxygen and less than 1% carbon dioxide. If the oxygen content is reduced below 15%, most ordinary combustibles will not burn. INERGEN agent will reduce the oxygen content to approximately 12.5% while increasing the carbon dioxide content to about 3%. The increase in the carbon dioxide content increases a person’s respiration rate and the body’s ability to absorb oxygen. Simply stated, the human body is stimulated by the carbon dioxide to breathe more deeply and rapidly to compensate for the lower oxygen content of the atmosphere. 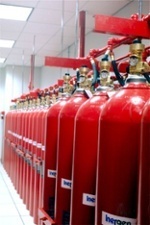 INERGEN is an effective fire extinguishing agent that can be used on many types of fires. 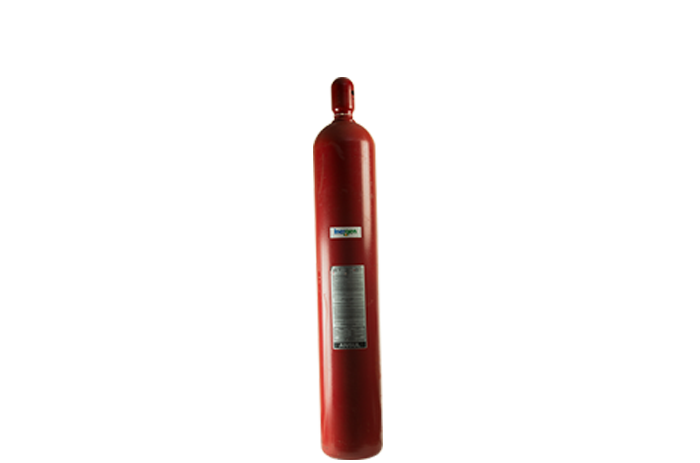 INERGEN extinguishing system units are designed for total flooding protection against Class A surface burning, Class B flammable liquid, and Class C fires occurring within an enclosure by lowering the oxygen content below the level that supports combustion. INERGEN agent has been tested by FMRC for inerting capabilities. Those tests have shown that INERGEN agent, at design concentrations between 40% and 50%, has successfully inerted mixtures of propane/air, and methane/air.